either on student's own horse on on her 16 hh Lusitano stallion schoolmaster., Prazer. 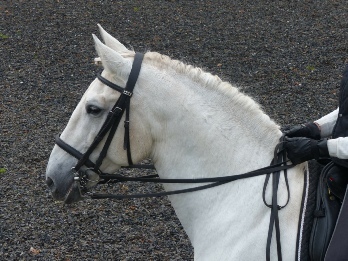 These lessons are designed to enhance your sense of Feel, Seat and understanding of the Weight Aids for all the dressage movements up to Advanced levels. There is a strict weight limit of 11 stone (155 pounds or 74 Kg) for Prazer who is a very supple 19 y.o. It is important that riders are confident and have gained an independent seat before riding such a sensitive horse. You do not necessarily need to have a background of dressage. Sylvia has helped many event riders, show-jumpers or even happy hackers provided they want to learn a better and more balanced way of doing things. 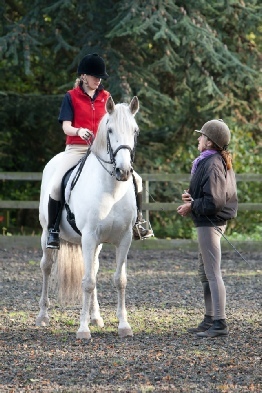 First Assessment lesson (a longer session) on Schoolmaster with an Overview of your general position and riding... £80.00 for CRC and non CRC Members alike. 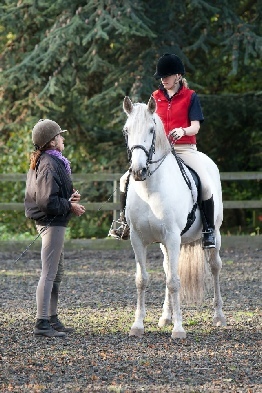 Lessons on Prazer or on ones own horse take place in a lovely outdoor area in Suffolk. You should have your own insurance as at present Sylvia is unable to insure students for lessons given on her own horse at a yard, not owned by her. To date, she has never had a claim made against her in 45 years of teaching.